We Heart Mac and Cheese: We Like It Like That: The Comme Ça Mac C'est Magnifique! We Like It Like That: The Comme Ça Mac C'est Magnifique! Hilary: So, here we are at Comme Ça to sample the macaroni and cheese, which I personally believe to be the best in Los Angeles. We enjoyed it here a few months ago but didn’t take photos. Fortunately, Suzy, I didn’t have to twist your arm too hard to talk you into a return engagement. Suzy: It couldn’t come soon enough. This is a really, really good mac. In fact, everything about Comme Ça’s food is strong. I can’t believe how much I am enjoying this salad, and I am pretty sure I’ve never felt that way before. The heirloom tomatoes explode with flavor, the green beans are blanched to the perfect tenderness, the vinaigrette is just sweet enough to balance the bitterness of the frisee. Hilary, try this chunk of pink heirloom tomato. Hilary: OMG! It’s the best tomato I’ve ever eaten! Hilary: Here, have some of my salad. It’s red and gold roasted beets with microgreens and some goat cheese encrusted with ground pistachios. So good. Hilary: That is some good lookin’ mac. But enough of that. Okay, I’m diving in. Oooh. Ahhhh. Mmmmm. Hilary: Mmmm… It tastes more buttery and less cheesy than I remember. Still so delicious, though. Suzy: Yeah, definitely buttery. Write that down. I’m glad you volunteered to take notes so I can eat it all while you’re busy writing. Hilary: Heyyy! Wait a minute! Mmm. I can see the cheese lurking in there and I’m tasting it more clearly now. Suzy: Me too, the flavor builds without overpowering. You know what? 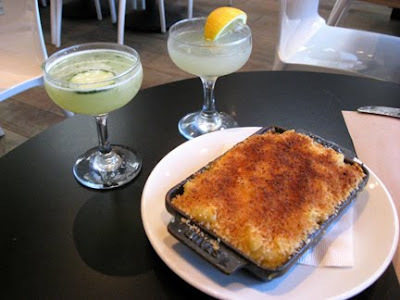 I think maybe our first bites of macaroni and cheese were a bit compromised because our tastebuds are still reeling from these excellent cocktails. Hilary: Good call. Comme Ça makes a mean cocktail. My “dealer’s choice” cocktail is super. I requested vodka and a tart flavor profile, and this has lime and cucumber in it. Sounds odd but very fresh tasting. What’s in your cocktail? Suzy: I asked for something herbal, and left the choice of spirits up to the bartender. I think he said it’s Spanish gin, St Germain elderflower liqueur, violet liqueur and a bit of lemon. Icy cold. Bracing in several different ways! But I’m going to sip water for a while, the better to savor the nuances of the macaroni and cheese. Hilary: Good idea. Try some of this amazing fresh bread, too. And make sure to slather it in butter -- it is Julia Child week after all. Mmmm. Suzy: Mmmm. [silence] So good. So creamy. I wonder what varieties of cheese are used? There’s definitely Cheddar, and you can tell it’s a really good Cheddar because there is a lot of flavor without the noodles having to tangle with tons of cheese. Yeah, these folks know their cheese. Even the little wedge of Brie on my salad was super yummy -- it stood up to the world’s best tomatoes. [Hilary nods vigorously in agreement, mouth too full to speak] The chef here must make it a priority to locate top-notch ingredients. Hilary: The Comme Ça presentation is impressive, too. 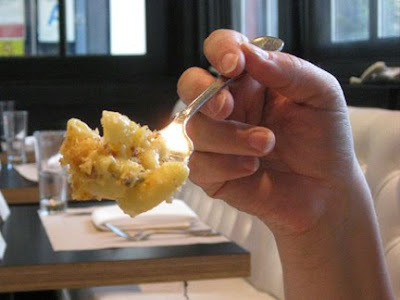 The macaroni and cheese is served in a very shallow cast iron dish, so that the food is only about an inch deep. Rather than seeming stingy, this creates the perfect mac-to-topping ratio so that you get a lot of crunch in every bite. I don’t know what kind of breadcrumbs they use, but they are delicious! Suzy: I think they look like panko crumbs but the waitress called them “croutons.” I can’t imagine a swank place like this buying off-the-shelf croutons and crushing them, although I might try that at home (note to self…). Another possibility is they might slice up yesterday’s leftover bread, dry it out and rub it with garlic cloves before taking it for a spin in the food processor. Just a guess. Hilary: The other great thing about the cast iron dish is that it keeps the mac nice and hot, all the way to the last bite. Suzy: Mmmm. Let’s not arrive at that last bite too quickly. [much thoughtful savoring] This has a fantastic balance of textures. The elbows are cooked perfectly – they’re not too floppy. There is just enough sauce to coat them but they’re not drowning, and the flaky topping makes little explosions in your mouth to offset the richness. Hilary: Right. 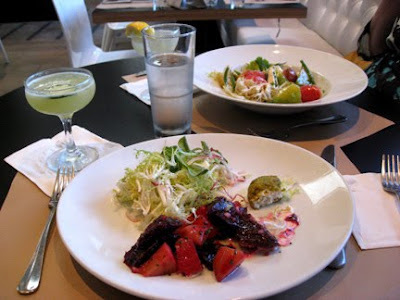 The waitress revealed that there is crème fraiche in here, and along with its creaminess, crème fraiche has a tartness that keeps the dish from seeming too filling. She said the Cheddar is from Vermont, too. Suzy: Hey, I just learned that “Vermont Cheddar” may mean that the Cheddar is actually from Vermont, but it also has come to mean a uniquely American style of aged Cheddar that originated in Vermont but may also be made elsewhere. But it sounded like the waitress meant made-in-Vermont. Hilary: Interesting. Comme Ça is high class, sourcing only the best of the best. How much will this mac set us back? Hilary: I think we agree the Comme Ça macaroni and cheese excels in every aspect: taste, texture, presentation and value. Suzy: Plus we get to relax in this gracious room and catch occasional glimpses of that unbelievably handsome young bartender. Hilary: I’ll say! Sounds like four thumbs up. Suzy: Way up. But I’m not sure we completely captured the essence of this mac for our readers. We might need to evaluate it more thoroughly. How about next Tuesday?